Welcome to the new study from Let's Talk About Ministries "Living in relationship with Jesus" series. 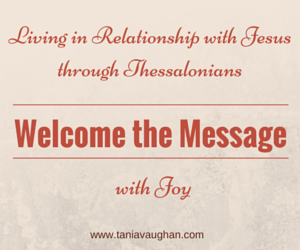 This 8 week series will follow Paul's letters to the Thessalonians. This first chapter is full of thanks, praise and recognition for the church in Thessalonica. Paul wanted to encourage them in all they were doing, and for their obedience and faith. They had become a model to other believers, not only those living in the town of Thessalonica but throughout Achaia (Greece) and Macedonia, but it didn't stop there. In fact, in verse 8 Paul says "Your faith in God has become known everywhere". How well known is your faith in God? Do those in your school, workplace or friendship group know what you believe? Do they see you live it? Verse 6 says, "You became imitators of us and of the Lord". Are you imitating God or are you a better reflection of the the people around you living without faith? It's easy when you're surrounded by unbelievers to slip into ungodly ways; a gossip over coffee, a bit of bad language, a burst of anger, flirting with a friend - What did your day really look like today? When we start to conform rather than imitate God it can be because we don't want to suffer ridicule, or we want to fit in better or maybe we're embarrassed. We can see that the Thessalonian church was experiencing "severe suffering", but in spite of it they were "welcoming the message with joy" (verse 6). How is that possible? How can you find joy in sharing your faith in the face of ridicule? How can you imitate Christ Jesus when it goes against the flow of the world around you? To overcome fear, to become an imitator of God, to witness, to let others see Jesus in you and to share your faith, you need to know the gospel. Listen to what Paul says about how they became known, "The Lord's message rang out from you" (verse 8). It could only ring out from them if they knew it, and then they lived (imitated) what they knew. The people everywhere saw them living differently (verses 9-10) "They tell how you turned to God..."
How do you become known as a follower of Jesus? Turn to God and know him! You cannot share what you do not know. Love that truth. Digging into God's word daily will equip all of us to know and then be able to share with others who Jesus is. Thessalonians has so much depth to it. Thank you for your insight. Great post here, I love 1 Thessalonians and it's a great exhortation to be in the Word. I appreciate you linking it up with us at Grace & Truth!